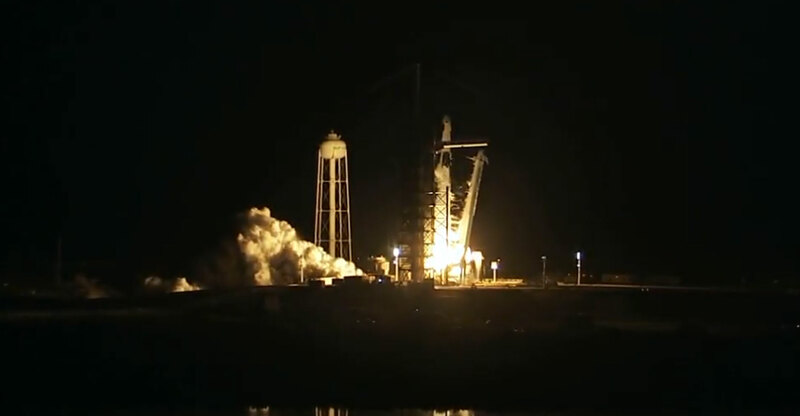 SpaceX launched an unmanned Crew Dragon craft from Florida to the International Space Station early on Saturday, a milestone for Elon Musk’s goal of enabling humans to live on other planets and a big win for Nasa’s gamble of partnering with private industry. Watch the launch video below. Scores of space tourists gathered in Florida to watch the 2.49am launch of the Falcon 9 rocket, which went off without a hitch. Crew Dragon is en route to a rendezvous with the station on Sunday, while SpaceX landed the rocket’s first stage on a drone ship in the ocean. Musk’s company has already made several supply runs to the orbiting lab for Nasa. But proving that SpaceX can safely fly humans is key to the company’s ambitions for space tourism and creating a human colony on Mars. Though no astronauts were aboard this first demonstration flight, the successful launch is critical in persuading any doubters and paves the way for SpaceX to launch with astronauts as soon as this (northern hemisphere) summer. In 2014, Nasa awarded SpaceX and rival Boeing combined contracts worth up to US$6.8-billion to fly US astronauts to the space station. The agency chose two companies for the unique public-private partnership to assure safe, reliable and cost-effective access to space while avoiding the perils of one provider having a monopoly. The US government is also eager to have the ability to fly to the ISS without buying seats on Russian Soyuz capsules. Early on Saturday, Nasa’s Twitter feed and blog posts were filled with images of SpaceX’s Falcon 9 rocket carrying Crew Dragon vertical on the launch pad. Falcon 9 lifted off from the Kennedy Space Center’s Launch Complex 39A, the launch site for the Apollo 11 mission that put humans on the moon. As Crew Dragon hurls through space, SpaceX will command the craft from its control centre in Hawthorne, California, while Nasa teams will monitor operations throughout the flight from the agency’s mission control centre at the Johnson Space Center in Houston. Crew Dragon is slated to dock with the ISS around 6am Eastern time (1pm South African time) on Sunday. The stakes for SpaceX are huge. Though the company has shaken up the stodgy aerospace industry by designing rockets for rapid reusability, and pioneering entertaining, informative live streams featuring young engineers, it’s never flown astronauts. Saturday’s flight is a dress rehearsal for the first manned spaceflight from US soil since the Space Shuttle was grounded in 2011. The Crew Dragon includes a new emergency escape system, first tested in 2015, that’s designed to carry astronauts to safety if there’s an emergency. Gwynne Shotwell, SpaceX’s president and chief operating officer, spoke on Thursday evening to students at Northwestern University in Evanston, Illinois, her alma mater. She told a packed audience that she has taken to referring internally at SpaceX to the first two astronauts slated to fly on Crew Dragon as “the dads”. For this weekend’s scheduled flight, a mannequin outfitted with sensors will be on board. Her name is Ripley, a tongue-in-cheek, Muskian reference to the protagonist of the Alien films. The company has always seen publicity and education as key to gaining public support. Shotwell said she looks at the Earth’s population and sees billions of potential customers for future SpaceX flights that feature tourists instead of astronauts.